North Carolina is a relatively simple state for homeschooling. The Department of Non-Public Education (DNPE) is the official government department for administrating homeschool regulations in NC. The DNPE website is a bit difficult to navigate and the way the homeschooling info on-site reads can make it difficult to separate law from what we'd like you to do. There is also the noxious posting of every registered homeschool in NC on an online list. The DNPE does not honor requests to keep your information private. In order to legally homeschool children between the ages of 7 and 16 in NC, you must register your homeschool with the DNPE. In return you will receive a little orange card that means you are an official Non-Public School in the state of NC. >>note on this after item #2. >>Sending the NOI is easy. Just send a letter stating that you will be homeschooling, that you (or your spouse or whoever you choose) will be the chief administrator and owner (this can be the same person or two different people) and the name of your school. The owner/administrator must have a high school diploma *or it’s equivalent*. >>Part 1 and Part 2 of the Code sound frightening but all this means is that you are either religious or not religious. >>The fact that you must keep immunization records for your children does not mean that you have to immunize. It just means that you have to be able to access some sort of written information indicating what vaccinations your children have received, if any. The attendance records seem a bit goofy to me but it's in the law, so keep them. >>Testing can be done with the CAT which many homeschoolers use because you can do it at home, rather than having to find a testing center. So long as you’re careful to administer a *nationally* standardized test and not a state or locally standardized test (the EOGs will not do), you will be fine. (The EOGs are the NC End of Grade exams that all public schools administer at the end of the year. Our local school administrators generously offered to test my children for me, but because the NC DNPE does not recognize these as adequate indicators for their measuring purposes, we do not use the EOGs.) Also note that while you must test, you child does not have to attain any particular stanine or percentile on the test. You also are not required to administer any particular grade level test. Potentially you could offer your kindergardener an SAT...or your high school senior a 3rd grade CAT! 7. Notify DNPE when the school is no longer in operation. These are the requirements. There is a long list of things the DNPE would like for you to do, but they are legally unnecessary, time consuming and if enough folks participate in the voluntary information sharing, the laws are likely to change to reflect this and make more paperwork for us to do and give the state more access to our personal lives. By and large, NC is a state where religious homeschool groups outnumber secular groups. If you are looking for a particular type of group in your area and can't find it, start one! You might be surprised to find like-minded people all around you. If you search here, you may find just what you're looking for. If you start your own group, you might post it there so that others can find you. Yahoo has several NC-homeschool groups. You can simply do a group search using NC and home school as your key words and you should come up with some satisfying results. There will be a a homeschool conference and book fair in Winston-Salem on May 22-24, 2008. The group hosting is a Christian homeschool group and though I've never attended the conference, rumor has it that it is big and wonderful. Overall, North Carolina is very homeschool-friendly and there is a pretty good infrastructure in place for those who are new to homeschooling or to North Carolina. We are also blessed to be in a state with rich history, great public universities, and tremendous natural resources from the coast to the mountains. Do Homeschoolers Have it Right? Too often I am confronted with people who act as if my choice to homeschool somehow belittles their choice to send their children to school outside the home. I must confess that it is comforting to me to be able to tell them that I'm not married to the idea of homeschooling and that I don't press my children into homeschooling--at a certain age, the choice is up to them and they haven't all chosen it. My eldest child graduated from prep school, the next one from homeschool, the next one in line--my step-daughter--is not in the least interested in being homeschooled, the two youngest will both probably be homeschool graduates. I'm all for freedom of choice and finding the educational model that fits each child best. Maybe that's the very thing that seems threatening? Somewhere in the back of our collective family brain is the voice of Mel Gibson/William Wallace screaming, "Freeeeedoooommmm!" but that doesn't seem to be the case in the families of the people who are so ready to attack me in their own defense. Perhaps they know there is something wrong with the 'one approach for all learning styles' way of educating. Could be they've realized that the set-up of a typical school does some damage to their children (mostly in the form of meanness from peers). Maybe my demeanor just sets people off. Who knows? One thing for sure: I'm not the only homeschool parent who has felt this sort of reverse judgment and found it mystifying. A friend once noted that homeschooling is kind of like having tattoos: Folks who have tattoos don't generally look at people with uninked skin and think, "Now why don't they have any tattoos?" I believe that the freedom to educate our children in the way we see fit is at the core of nearly every decision to homeschool. There are so many 'kinds' of homeschoolers and though our decision making processes vary, I feel confident that most have that one idea in the mix somewhere. I have often laughingly tried to categorize homeschoolers into several neat little boxes labeled with names like: Unschoolers --the ones wearing tie-dye and acting like they've never been in public before; Prep-School-At-Home --look for the chinos and polos; hippies --kind of like unschoolers but with a paranoid look about them, the tie-dyes are in much darker colors and they are munching sprouts; Fundamentalist Christians--the boys all look like they just stepped out of GQ and the girls have unshorn hair and stained denim jumpers; My Kid Got Beat Up At Schoolers--the mom's are all very nervous and overprotective and the kids are either whiny or completely obnoxious. Please don't be offended if you see yourself in there. I will admit that we are a mix of several of those categories (khakis with dark tie-dyes and the overprotective mommy syndrome. Sprouts on the side, please.) Do you know what I hear their collective family brains screaming? "Freeeeeedoooommmm!" Each family decided to school their children in the way they believe is best. Do those people who send their children off on the Big Yellow Bus feel like they need to protect the status quo of the majority (who do, indeed, send their kids to PS) by acting as if by our simple act of homeschooling we were declaring of war on society? Do they feel like we love our kids more because we can spend all day with them without braining them? I'm really never certain what to say when someone finds out that we homeschool and then sets off on a defensive rant about their choice to public/private school their children. These are choices that every parent has to face. Is there something in the PBJ stained faces of homeschooled kids at noon in a grocery line that touches a nerve? Maybe it does. Maybe it's envy. Maybe it's a desire to wipe the jelly off. I remember when all of my kids were in school, I was single and working full-time and I saw those PBJ-faced kids...I thought, "I wish that was us." I suspected that homeschoolers had it right and I wanted to be one of them. Do homeschoolers have it right? For my family, the answer is yes, we do have it right but for a lot of people the answer is that public or private school is the right choice for their families. There is room for all of us and our personal choices and I'm glad to live in a place where that is so. For many homeschool families, co-ops are a way of life. In most heavily populated areas there are many choices of activities for enrichment both in the arts and for educational purposes in the forms of cooperatives, classes, athletic teams and music lessons, as well as numerous other things. 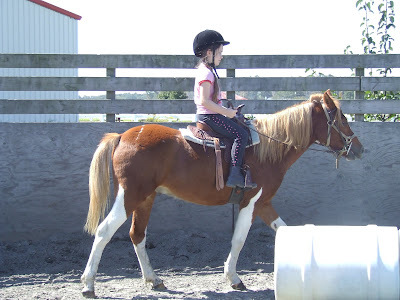 Our family is involved with 2 cooperatives, 4H, horseback riding lessons and a homeschool equestrian vaulting group. We love all of them but our involvement brings up questions like: How much outside the home activity can this slightly introverted mother stand? When do we stay home, do chores, read aloud and just enjoy life? Do the co-ops somehow mean I enjoy life less? Are we still homeschooling if someone else is teaching my kids most of what they need to learn? It has been my personal observation that one of the most difficult parts of being an adult is that we have to make real decisions. Decisions that effect the quality of life for everyone in our family. Obviously, we all have to find the right balance for our own families and for us, four days out is too much. We have a farm. It’s very small, granted, but we have a flock of sheep who are going to be lambing any day, several horses, a garden that is in spring process, chickens who are laying like crazy and many other animals who need attention, food, water and the occasional pooper scooper to come along. We need quality time at home to keep up with the To-Do list. Our life satisfaction suffers when we don’t have the time to completely care for our home and animals. Perhaps these decisions about what to participate in and when to decline aren’t so difficult for families who have fewer chores at home, who live closer to town, or are extroverted. For us, balancing the social needs of a teenager, a 6 year old and the anti-social (hah!) needs of Mom, can be difficult. My best tips for coping are these: when something too good to pass up comes along, commit for a month before you commit forever; try having friends over instead of using activities and co-ops as the sole social outlet for kids, do sleep overs, game nights, whatever sounds good to your kids; be realistic about how many activities you can fit into a week and stand by it; when all else fails, don’t hesitate to admit that you are over committed and then make the choices best for your family; don’t burn any bridges, the homeschool community is remarkably small and your reputation is important, be kind even when you are bowing out of a commitment or co-op; keep track of your spending. For most homeschool families, finance is an issue and it is really easy to spend too much on lessons that aren’t gratifying for children or parents or to continue participation long after enjoyment has waned. It’s okay to reevaluate. At one point, my kids were taking so many classes at cooperatives that I didn’t have time to do any HOMEschooling at all. I have begun to call this process of not sending the kids to school but not teaching them at home either, Share-Schooling. It’s a great concept, in my opinion, but not one that I really want to participate in. I want to help my kids learn at home, to read great literature and do science experiments with jell-O and mentos, not to mention the ongoing science experiment that we are living with organic gardens and pregnant mammals right here! Then there’s the quality of life question...is our life really, truly enriched by our participation in the co-ops? Are there classes that can be dropped to make our participation a bit less, while still keeping the kids in touch with their friends and involved in the things that make life without school fun? These are issues that we negotiate semi-annually and the answers are different every time but we keep an eye on what we’re doing and how it effects our lives and if we find that we’re worn out or stressed out, we let something go. Gracefully, hopefully. I see extracurricular participation as a great asset for homeschool families. It gets us out there and connected with our community but we also have to remember the reasons we chose to homeschool to begin with, keep those reasons in our sights, and make decisions by honoring the needs of our families. A few years ago, a friend introduced me to Waldorf education. I read some books, joined a Waldorf web group, thought the educational style and philosophy were a good fit for my family and decided to give it a go. I went to a Barbara Dewey seminar, learned to knit, started saving the wool from our meat sheep just in case I wanted to stuff a handmade doll, and we were off! Waldorf was created by Rudolph Steiner in Germany in the early part of the 20th century. Steiner was voluminous in his lectures and writings. He founded a spiritual movement called Theosophy based on Anthroposophy. Theosophy and Waldorf are linked, not only by their creator but also by the people who educate their children with a Steineresque vision. I cannot begin to tell you how difficult it is for me to find the line between the educational philosophy and the religion, much less where I’m willing to toe up to that line. Steiner posited that children incarnate in certain ways, at certain times of their lives and that if you educate them wrongly, you might damage that child on a soul level. For me, and many of the parents who enjoy the Waldorf approach to education--a soothing daily and weekly rhythm, lots of time spent outdoors and in natural settings, limited media exposure, toys made of beautiful, natural materials and, as they grow, a classical, block-lesson plan which does not skimp on languages and the arts--it's sometimes difficult to find the place where a wonderful educational approach ends and dogmatic thinking begins. I think it's worth it to wrangle with this line because of the beauty of this educational model. The basic thought is that there are stages of development, which are clearly defined as from 0-7, 7-14, and 14-21. My dad swears that these stages continue through our adult lives and that his taste buds change every 7 years! To officially give a Waldorf education, say the hardliners, you must send your child to a school. To contrast with the official Waldorf school education, we refer to what we do as a Waldorf-inspired homeschool education. 1. Apparently there is a secret text that gives us the subject lists that should be taught each year so that most accepted-as-important subjects are covered at the right time for the child. It is an expensive book but there is a lot of information in it for those dedicated to the Waldorf approach. Of course, there are tons of other resources, I just found this to be a ‘must-have’ for our homeschool. 2. First grade begins when your child has lived through 7 springs, including the one when they are 0 years old. Keep in mind that summer begins on June 21st. So, if you have a child born in August, that child will be 6 during Kindergarden and 7 during first grade, if you use the traditional September through June school calendar. 4. I look at Waldorf as something to aspire to, like perfection. I don't expect to achieve it in it's purest form (and there is a lot of debate about what, exactly, that is.) Don't kick yourself if your kid watches 6 hours of cartoons one Saturday while you're running errands or are down with the flu. 5. Compile a reading list and start working on it. There are a lot of great books out there and there are many, many people who will recommend their favorites to you. The online Waldorf library is a great place to begin. 6. Begin with small steps. Get rid of those plastic toys or turn off the TV. Do a puppet show with your kids or take a long nature hike and draw a picture of something you see. Realize that lasting change generally takes place slowly, with awareness of an end goal. Waldorf-inspired homeschooling can be fun, relaxing, challenging and a good way to opt out of the hectic, dare I say frantic?, lives that so many families live. Waldorf isn't for everyone. It really requires a dedication to a quiet, calm way of life but even for those who enjoy more activity, elements of Waldorf can enhance your homeschool experience by opening you to different ways of approaching your child/ren's education. For us it’s something we weave into our lives but not the principle by which our lives are governed. Like with all things homeschool-related, take what you need from it and leave the rest.